One of the most common injuries occurring on the basketball courts are ankle related. Ankle sprains plague outdoors pickup courts and professional hardwood arenas alike. This is a major issue for a lot of players since an ankle sprain can really persist, and once injured, an ankle always has a higher probability of giving in repeatedly. Obviously, the nature of the sport puts a lot of strain on your legs in general and some protection is always welcomed. Ankle braces have been around for quite a while, but for the longest time, people simply haven’t been using them. Players like Steph Curry contributed a lot in changing the perspective regarding ankle braces. Nowadays, everybody uses in order to prevent severe injuries. Ankle braces nowadays come in a wide variety and they offer various levels of support. When picking out one that you feel the most comfortable with, there are a couple of factors that you need to take into account. This is the most important thing you consider. If you are suffered major injuries during your playing time, you would usually look for a complete support ankle brace – a one that offers maximum, protection. But these usually have a drawback in the form of somewhat limited movement. 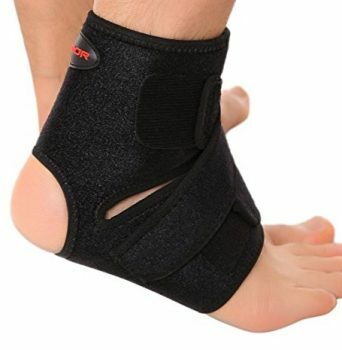 On the other hand, an amateur player that just occasionally feels some ankle pain after a rough session of playing ball doesn’t actually need a full support brace. A simple “tightener” could do just fine and provide just that bit of security and support. There are a couple of types of braces and based on the intended use, you should look into them. That is definitely the most important criteria that will take you to the rest. This can also be explained by using words like snugness and comfort. Your ankle brace needs to feel like a natural part of your gear. You basically want to not notice it while unless you need it. Basically, when you run straight you don’t want it to interfere with your movement, but when you turn a sharp corner or do a crossover, you want to feel its effect. Ankle braces work best when you are satisfied with both comfort and protection that it offers. And in regards to quality, this is a piece of equipment you do not want to buy way too often. So naturally, look for products made of high-quality materials that are able to cope with the strain you put on it. Usually, no price is too steep when it comes to injury prevention, but ankle braces can get a bit pricey. So, while doing research for this article, we did some comparison on our own and really compared what different models have to offer in terms of features for the price. After combing a lot of models, we found a couple of ankle braces that scored well through all three of the categories and compiled a list. I-Fit – adjustable fasteners providing an individualized fit, enhanced comfort and variable compression levels. This is a model that offers moderate support. It doesn’t use plates but Velcro and straps combined offer a really reliable feel and the amount of support is surprising. If you are not exactly looking to completely lock up that ankle, this is probably a good choice. The level of support can be adjusted and you can target the area to apply the pressure and make other areas more flexible if needed. It should be noted that with prices starting from just $20, this is really a smart buy. This is one of the most popular models among amateur players because it offers a great amount of support with little to now compromise reflecting on the motion. And it does so for a very competitive price. 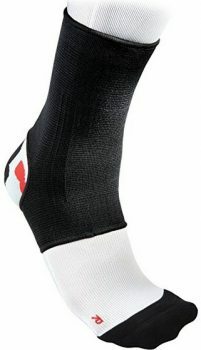 This is a high-quality ankle brace that is light and durable and can fit in almost any type of shoe. 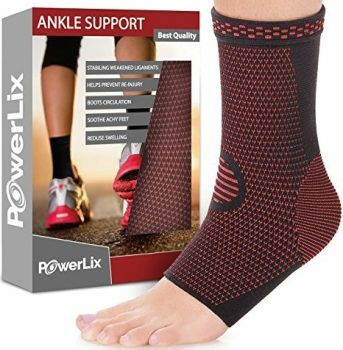 This ankle brace features an open heel design and comes in various sizes. 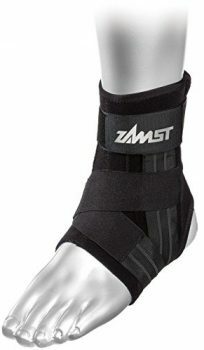 This design allows it to secure the ankle with tension straps without compromising flexibility and the range of motion. If you are looking for an all-around support (not just basketball, running, other activities), this is definitely a product to take into consideration. It is light, durable and offers an excellent amount of support while not putting any strain on your foot. If you are simply looking to prevent minor injuries, this is a smart buy. Adjustable tension straps in a cross design that offer stability and flexibility. 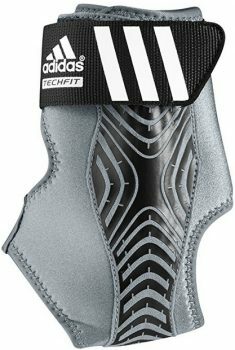 Adidas is one of the major suppliers of sporting apparel and equipment and naturally, they offer ankle braces as well. This model is suitable for amateurs and semiprofessionals looking to add just an extra layer of protection without compromising movement. 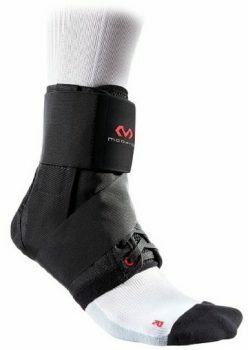 This is a simple ankle brace that offers quite a bit of support against ankle rolling under stress. Made from high-quality material and with a single purpose in mind, this is one of the smartest buys on the market, considering the very competitive pricing of course. The main reason this model found its way on our list is versatility. This is not just an ankle brace for basketball players, it can be used for soccer, volleyball, running and a plethora of other activities like running and hiking. The reason behind this versatility lies in the design of this model. It uses breathable neoprene and adjustable straps that allow you to tighten just the right parts of your foot and increase support while not compromising movement and comfort. Couple that with a really affordable price and you can realize on your own that this is a smart purchase. Universal fit makes usable on left and right ankles alike. 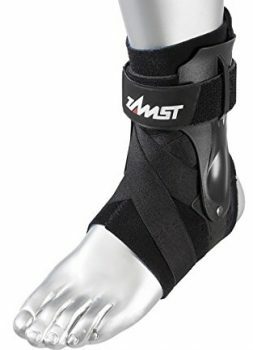 This is an excellent product from a manufacturer that supplies Steph Curry with ankle braces. 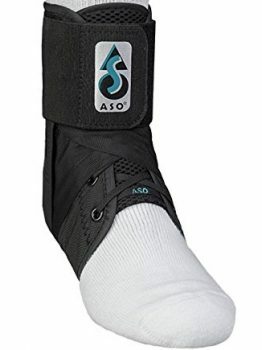 The A1 Ankle brace is sort of an all-rounder as it offers excellent support, good amount of protection without compromising the comfort or flexibility. The L and Y strap design offer lateral stability and protection from inversion sprains. 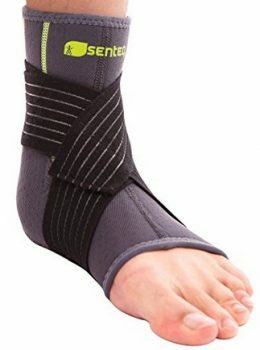 This is a leg specific ankle brace but that design allows it to be highly efficient when it comes to protection you from ankle rolls, and incredibly durable. This is definitely a smart buy for those looking for an increased level of security without using plates. Y-Straps prevent un-natural movement and offer additional support. 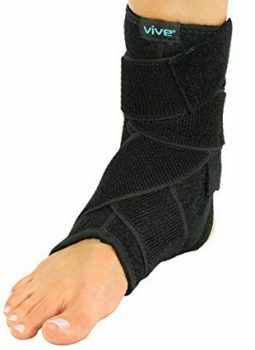 Ankle brace sleeves are designed for people simply looking for some added tension on the ankle. One of the best examples of effective ankle sleeves is this model by Sleeve Stars. Whether you have issues with Plantar Fasciitis, Achilles heel or any other problems with your foot in general, trying a solution like this one will definitely alleviate some of the pain. And starting for a bit over $10, this is an easy choice. For a basic support model, you will have a hard time finding a smarter purchase. Usable for all sorts of activity: basketball, football, soccer, running, walking, etc. Made from premium material that lasts for a couple of years. Ankle brace sleeves usually are a lighter version of standard braces, but with this model, you get almost the same level of protection as with some of the high-priced braces with plates. This model features crisscross reinforcement straps that support and stabilize your foot and prevent rolling while not limiting the range of motion. Made from high-grade material and designed for both men and women, you get a lot of value for your buck with this angle brace sleeve. Usable in any type of shoes, this is a smart buy and definitely a popular model amongst buyers. Simple design with crisscross straps that support bot ankle and Achilles tendons. When it comes to versatility, it’s hard to find an ankle sleeve that ranks better than this one. It offers an astonishing level of support and simultaneously combats multiple issues that you may have: joint pain, Plantar Fasciitis, Achilles tendon issues, heel spurs, etc. Or, you can use this model purely for injury recovery and support for sports activities like basketball, football, hiking, soccer, etc. Designed to fit any shoe, this really is an universal solution to many problems. Extremely versatile model and an extraordinary value for money. Angle brace sleeves usually serve multiple purposes and that is true for this model as well. Whether you are looking to increase circulation, reduce swelling, tighten the ankle or battle Plantar Fasciitis, this model will come in handy. You get true arch support. Anti bacteria material is being used combined with Mertz machine stitching adds extra level of support. Combine this versatility with a really competitive pricing, you will hardly find a better purchase. Ankle support features a great level of compression and the bottom helps with splint pain. You can wear these all day long or night because of thin design, that is a big plus. You don’t always need support in terms of high pressure on your ankle. Often times you just need a small amount of compression in order to stay aware of the problems causing you pain. 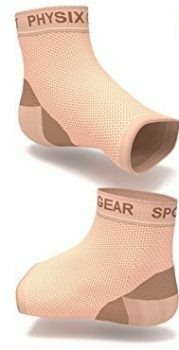 McDavid 511 model ankle brace sleeve will help you alleviate pain caused by weight stress, arthritis, Achilles tendon issues and other minor injuries. This is what many people call the first level of protection and you can use these as a precautionary measure as well. If you don’t want to compromise move-ability and protect your feet from minor injuries, this is a good solution. We really did a thorough research on this subject and following our criteria, you will hardly find better alternatives to these products. 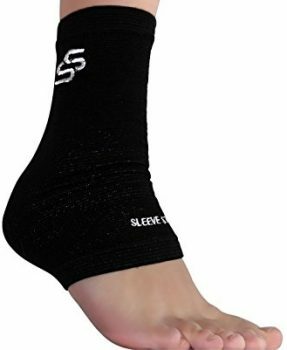 Ankle braces and sleeves are a necessity these days if you are looking for a solution to combat the issues plaguing your ankles and feet in general, all the picks from this list are smart buys. That’s not to say that there isn’t other products that will serve you well, but when it comes to value for the money invested, these ones perform the best.